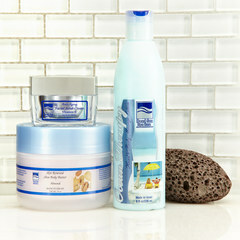 Are you looking for the skin care products with the beneficial properties of the Dead Sea minerals? 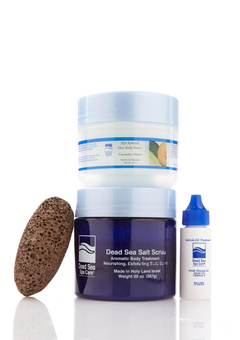 Dead Sea Spa Care has assembled a variety of anti aging skin care products as part of their facial skin care products line. People love giving and receiving Dead Sea products because they are not only lovely gifts, but the anti aging skin care product are actually wonderful for your skin. We offer a variety of Dead Sea anti aging skin care products for someone looking to relax or a to pamper your facial skin. It's because of these amazing benefits of these anti wrinkle skin care products that any Dead Sea Products you give yourself or someone you live from the Dead Sea Spa Care line will be gift ideas really appreciated. You can select anyone of the anti aging Dead Sea Spa Care products and treat those special people in your life to a home spa treatment. 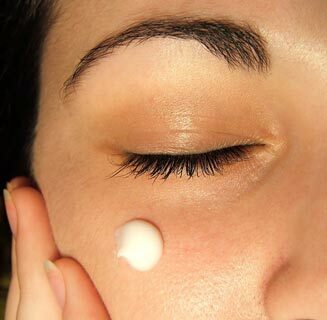 Your skin will be very appreciative after using these anti aging skin care products. 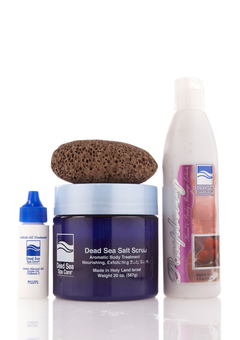 The Dead Sea Spa Care 16 oz Salt/Shea Set includes all the skin care products you need to exfoliate and soften your dry skin. Simply apply a spoonful of the salt scrub on the pumice stone while in the shower to exfoliate dry areas such as the heels on your feet, elbows or knees. You can use the salt scrub all over to cleans your skin. The Dry Salt Scrub is a great product to exfoliate your dry skin cells. 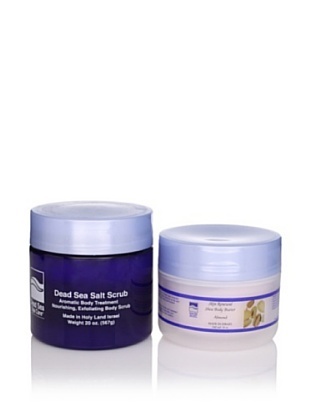 This Dead Sea dry salt scrub is a great body scrub for all of your exfoliating, scrubbing and polishing needs. 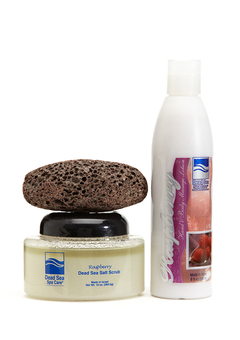 Your skin will feel smooth, soft and refreshed after using our aromatherapy scrub products. 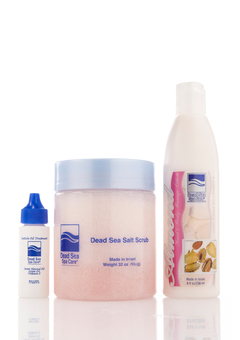 Our body scrubs use fine Dead Sea salt, and we use fragrance oil in our salt scrubs. Our scented body scrubs will leave your skin not only soft, but smelling wonderful. The Shea Body Butter should be used after the shower to moisturize your skin. Protect and hydrate your skin all day with the Dead Sea Spa Care rich formula blend of Sweet Almond Oil, Vitamin E, Avocado Oil and Jojoba Seed Oil used in the Dead Sea Spa Care Shea Body Butter. These wonderful, natural humectants plus the minerals from the Dead Sea intensify cell regeneration, leaving your skin instantly silky smooth and soft, not oily or greasy. All our products contain minerals from the Dead Sea, which are wonderful for your skin, and can be used for all skin types. 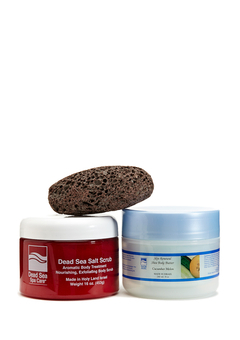 The Dead Sea Spa Care 16 oz Salt Scrub and Shea Butter Set makes wonderful presents for all occasions.